Located in the center of the Ria Formosa nature park just meters from the beach. 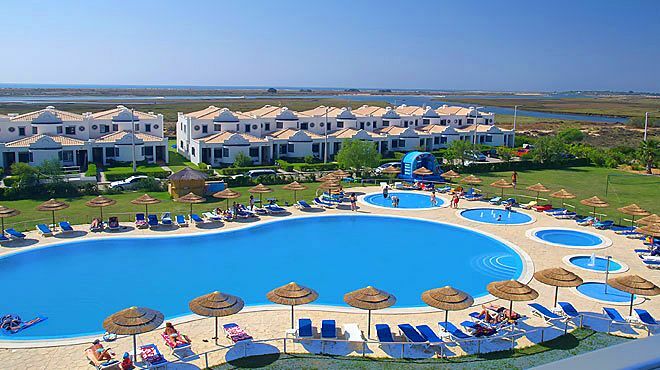 The resort is just a short distance from Tavira and the local shops, bars and restaurants not to mention all of the golf courses in the area. Cabanas Park Resort was built in 2004 and consists of 96 apartments. Located in the center of the Ria Formosa nature park just meters from the beach. The resort is just a short distance from Tavira and the local shops, bars and restaurants not to mention all of the golf courses in the area. The Resort is surrounded by natural gardens and swimming pools the resort has a very relaxed atmosphere. The spacious apartments are tastefully furnished and feature all of the modern comforts required to ensure that home from home feel, including a well equipped kitchen and satellite TV. Guests can choose from a number of dining options in the resort from la carte to buffet style restaurants. The Cabanas Park is well linked to the local transport network which make it very easy to access the surrounding areas.